On Friday, President Trump and his entourage will jet for the third straight weekend to a working getaway at his oceanfront Mar-a-Lago Club in Palm Beach, Florida. On Saturday, Trump's sons Eric and Donald Jr., with their Secret Service details in tow, will be nearly 8,000 miles away in the United Arab Emirates, attending the grand opening of a Trump-brand golf resort in the "Beverly Hills of Dubai." Meanwhile, New York police will keep watch outside the Trump Tower in Manhattan, the chosen home of first lady Melania Trump and son Barron. And the tiny township of Bedminster, N.J., is preparing for the daunting prospect that the local Trump golf course will serve as a sort of northern White House for as many as 10 weekends a year. Barely a month into the Trump presidency, the unusually elaborate lifestyle of America's new first family is straining the Secret Service and security officials, stirring financial and logistical concerns in several local communities, and costing far beyond what has been typical for past presidents — a price tag that, based on past assessments of presidential travel and security costs, could balloon into the hundreds of millions of dollars over the course of a four-year term. Adding to the costs and complications is Trump's inclination to conduct official business surrounded by crowds of people, such as his decision last weekend to host Japanese Prime Minister Shinzo Abe for a working dinner while Mar-a-Lago members dined nearby. President Trump's Mar-a-Lago golf club in Palm Beach, Fla., seen in November. Trump's three Mar-a-Lago trips since the inauguration have likely cost the federal treasury roughly $10 million, based on figures used in an October government report analyzing White House travel, including money for Coast Guard units to patrol the exposed shoreline and other military, security and staffing expenses associated with moving the apparatus of the presidency. In New York, the city is paying $500,000 a day to guard Trump Tower, according to police officials' estimates, an amount that could reach $183 million a year. 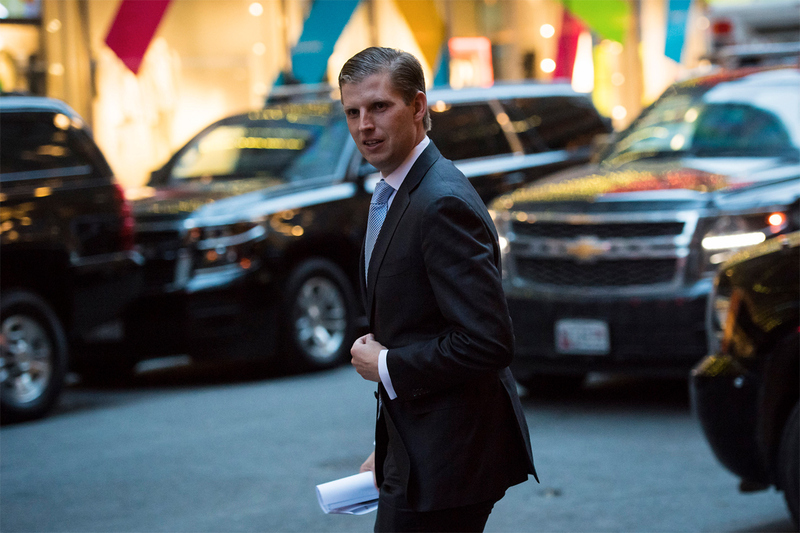 Earlier this month, the Post reported that Secret Service and U.S. embassy staff paid nearly $100,000 in hotel-room bills to support Eric Trump's trip to promote a Trump-brand condo tower in Uruguay. "This is an expensive way to conduct business, and the president should recognize that," said Tom Fitton, president of the conservative group Judicial Watch, which closely tracked President Barack Obama's family vacation costs and said it intends to continue the effort for the Trump administration. "The unique thing about President Trump is that he knows what it costs to run a plane." Fitton added, noting that Trump should consider using the presidential retreat of Camp David, a short helicopter ride from the White House, or even his golf course in northern Virginia. Of Mar-a-Lago, Fitton said, "Going down there ain't free." The Defense Department and Secret Service, for instance, have sought to rent space in Trump Tower, where leasing a floor can cost $1.5 million a year - though neither agency has disclosed any details. In addition, Trump's travel to his signature properties while trailed by a press corps beaming images to the world allows the official business of the presidency to double as marketing opportunities for his brand. The White House did not address broader concerns of the costs and potential conflicts inherent in Trump's early travels. But White House spokeswoman Stephanie Grisham told the Post this week that Trump is always working, even when he's left Washington behind. "He is not vacationing when he goes to Mar-a-Lago," Grisham said. "The President works nonstop every day of the week, no matter where he is." Trumps' frequent travel belies his repeated criticism of Obama as a "habitual vacationer" enjoying taxpayer-funded golf getaways. It also follows his own promises: He told the Hill newspaper in 2015, "I would rarely leave the White House because there's so much work to be done." Presidential families have for decades been guaranteed round-the-clock protection, no matter the expense or destination. Every presidency has brought new operational challenges and lifestyle habits, from George W. Bush's frequent stays at his remote ranch in Texas to Obama's annual trips to Martha's Vineyard and his native state of Hawaii. Judicial Watch estimated Obama-related travel expenses totaled nearly $97 million over eight years. But based on the first four weeks, Trump's presidency appears on track to cost hundreds of millions of dollars more. Agents are now tasked with guarding multiple homes and protecting Trump's four adult children, including the globe-trotting sons running the family business and daughter Ivanka, whose family recently moved into a Washington, D.C., neighborhood. "There was an anticipation of how stressful it was going to be on the agency, but the harsh reality is that the stress is just overwhelming," said Jonathan Wackrow, a 14-year Secret Service employee who served in Obama's detail and now works as executive director of the risk-mitigation company RANE. Even veteran agents, Wackrow said, are feeling the pressure of the "monumental" task, including manning high-security perimeters in Washington, Florida and New York, along with protecting family member's private-business travel across three continents. "It's a logistical nightmare," Wackrow said. Agents are "at severe risk of burnout, and the very last thing you want is to have your agents burnt out." A Secret Service spokesman said the agency is equipped to handle the demands of a Trump presidency. "Every administration presents unique challenges to which the Secret Service has effectively adapted," according to an agency statement. "Regardless of location ... the Secret Service is confident in our security plan." Experts and local officials have pointed to a string of security and logistical concerns surrounding Mar-a-Lago, the lavish estate Trump turned into a club in 1995 and now calls the "Winter White House." Club members pay $200,000 to join - a fee that has doubled since his election - and $14,000 a year to belong, giving them access to the beach, tennis courts, a spa and, now, on occasional weekends, to the president. 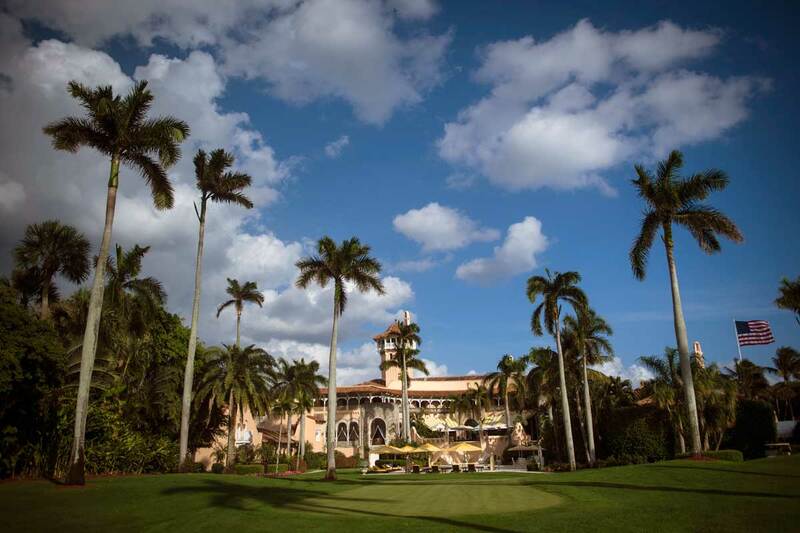 But Rep. Lois Frankel (D., Fla.), who represents Palm Beach, said Mar-a-Lago is a poor choice for a president's long-term home: an exposed oceanfront club on a narrow, busy island, where traffic problems were already routine. "Mar-a-Lago is no Camp David," Frankel said. "It's not set up with the intention or the forethought of keeping the president safe." The challenges for Mar-a-Lago as a presidential home were apparent from pictures posted on social media last weekend by club guests — including close-up images of the presidential limousine and a picture of a military official carrying the nuclear "football." In one Instagram video recorded Friday night outside Mar-a-Lago, a woman fawns as men with earpieces inspect under the hood of a line of cars heading into the club, "The Secret Service is so hot." The weekend brought the presidential entourage to two other Trump properties, as Trump and Abe golfed 27 holes at the president's courses in Jupiter and West Palm Beach. The events meant global publicity for the Trump brand — and even more security complications. In advance of Trump's Super Bowl weekend trip to Mar-a-Lago, the Secret Service paid for a bevy of security costs, including more than $12,000 for tents, portable toilets, light towers and golf carts, purchase orders show. The bills have racked up outside the club, too. Palm Beach County Sheriff Ric Bradshaw said Trump's 25 days in the county since the election have cost local taxpayers about $60,000 a day in overtime police payments. The Town of Palm Beach recently implemented a "presidential visit seasonal traffic mitigation plan" in hopes of stemming the island's worsening traffic woes. Running every weekend until May, the plan includes a town order demanding sanitation and public-works crews leave the island every Friday by 3 p.m.
Local officials usually only learn a few days in advance that the president is coming, said Kirk Blouin, the town's director of public safety. "We plan as if he is going to be here most weekends," Blouin said, "because otherwise it's too hard to plan." Overseas travel by Trump's adult sons is adding to the burden on taxpayers. Eric Trump has made trips to Uruguay and the Dominican Republic. Next stops: Dubai and Vancouver. Eric Trump and his security detail flew earlier this month to the Dominican Republic, during which the president's son met with developers proposing a Trump-brand luxury resort. Purchase orders showing government expendtires for that trip are not yet available, but records show that Secret Service officials traveled there in advance to scope out the area - staying at the five-star, oceanfront AlSol Del Mar hotel at a cost of $5,470. After this weekend's trip to Dubai — during which early Secret Service hotel bills have already surpassed $16,000, records show — the Trump brothers will travel to Vancouver for the Feb. 28 grand opening of another Trump-brand skyscraper. The best public estimate for the full cost of Trump's presidential getaways may come from a U.S. Government Accountability Office report in October, which estimated that a four-day trip for Obama cost taxpayers more than $3.6 million. During that Presidents' Day weekend trip in 2013, Obama flew to Chicago to give an economic speech, then to Palm City, Fla., to golf with Tiger Woods and the owner of the Houston Astros baseball team. The trip drew the ire of many Republicans in Congress, including U.S. Sen. John Barrasso (R., Wyo. ), who requested the GAO review Obama's costs. Asked whether Barrasso would file a similar request for Trump's trips, his spokeswoman said equating the two presidents' trips would be "misleading at best." "Former President Obama flew to Florida for the express purpose of a golf lesson and a round of golf with Tiger Woods. President Trump was in Florida with the Prime Minister of Japan," press secretary Laura Mengelkamp said in a statement. "Regardless, every level of the federal government needs to be mindful of the way it spends taxpayer dollars." In November, when Trump spent a weekend at his Trump National Golf Club in Bedminster, N.J., the 8,000-resident township received just 48 hours' notice demanding an all-hours security detail of six police officers from its 16-officer force. "Bedminster is a small municipality with a small police force and a small budget," Mayor Steven Parker wrote in a letter asking for federal help in recouping security costs. "We want to welcome President Trump with open arms, but we don't wish to burden our taxpayers disproportionately for these visits."